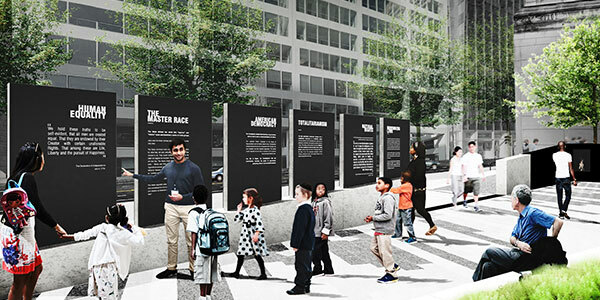 The Philadelphia Holocaust Remembrance Foundation (‘The PHRF’), a non-profit organization dedicated to educating the public about the universal lessons of the Holocaust, unveiled new details and images of the planned Philadelphia Holocaust Memorial Plaza at the highly-trafficked intersection of 16th Street and Ben Franklin Parkway in Philadelphia. The Plaza, which is funded in large part by donations from business leaders and residents across the region, is expected to begin construction this year. The update depicts the centerpiece of the new Plaza, known as the Six Pillars, which will be erected in memory of the six million Jewish victims of the Holocaust. Each pillar is engraved with a narrative that chronicles a motif of the Holocaust, contrasted with an adjacent pillar describing one of America’s core values. The purpose of the Pillars is to show that, through a commitment to American democracy and protections, the country can continue to protect against the evils that lead to totalitarianism and genocide. “Human Equality” vs. “The Master Race”, “American Democracy” vs. “Totalitarianism”, “Natural Rights” vs. “Nuremberg Laws”, “Freedom of Religion” vs. “Religious Persecution”, “Protecting Life and Liberty” vs. “Death Camps”, “Liberation” vs. “Bearing Witness”. 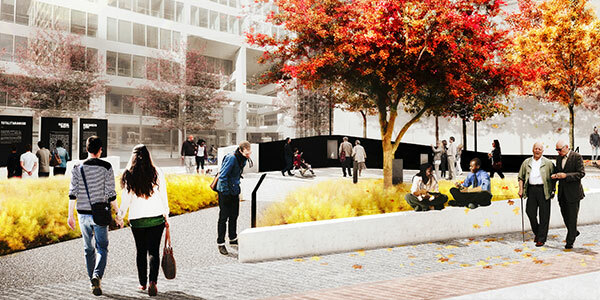 In addition to the Six Pillars, the new images show the configuration of the other components of the Plaza, including the black granite Remembrance Wall, which will create a somber enclosure, encouraging visitors to contemplate about the lives lost and the power of hate. Located at the western end of the plaza, the Wall will include a recessed Eternal Flame, which will serve as a further reminder of the determination of the global community to never forget. Embedded in the Plaza’s pavement will be train tracks, which represent the tragedy of Jews being herded onto trains to labor and death camps; also depicted is the “Thereisenstadt tree,” which was planted by surviving children from the Thereisenstadt concentration camp. 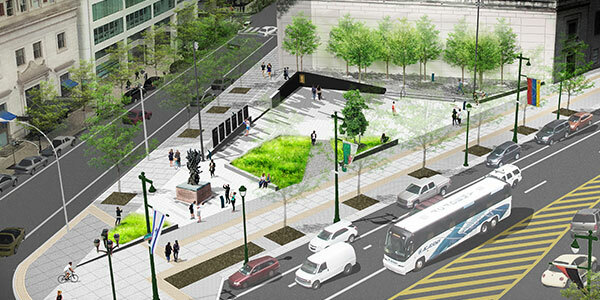 At the far western portion of the Plaza, the artists’ renderings depict The Forest, a planted grove, which hearkens back to the brave heroes of the resistance movement, who risked their lives to combat the evil forces in their midst. The Plaza will also encompass the existing Six Million Jewish Martyrs statue, which memorialized the Holocaust since 1964, and was the first such public monument in North America. Construction of the new plaza is set to commence this Winter. The project is ground leased from the City of Philadelphia, and is being funded by generous donations from private citizens and an RACP grant from the State of Pennsylvania. There are numerous sponsorship opportunities available for individuals or firms looking to play a role in preserving the stories of the Holocaust.